Tibetan Life, Issue #09 - Get Your Free E-Book! 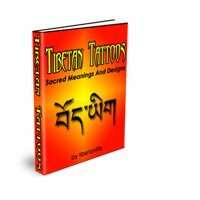 Get your very own Free Tibetan Tattoos Sacred Meanings And Designs e-book! 108 pages of amazing translations, symbols and designs. For the next month send in your entries then stay tuned for the winner in the next issue of the Tibetan Life Newsletter. You can send a photo of your own Tibetan tattoo, somebody else's tattoo (with their name and artist's name of course) or a design of your dream tattoo. Include a description or story with your photo to make your entry fascinating! If you don't want to wait for this awesome book, buy now and get the 25% Off Valentine Special! Each month, The Tibetan Life e-Zine is created by you with the questions you send me. Do you have a question, comment, or something else that you would like to share with our growing community of Tibetan Life fans? I heard that Tibetans feed their dead to birds! Is that true?? My mom just got a lhasa apso. Do you have info on Tibetan dogs like this? How are singing bowls used? How did you make your web site? Was it difficult? So, how do you know so much about Tibetans? But how to get to the bottom of this? How to go beyond its being a cute saying? Lama Yeshe is not kidding when he says that we need to be our own psychologists. You could argue that we’re not really Buddhists until we work on our minds. This is logical. In the second of the Four Noble Truths, Buddha asserts that the two main causes of our suffering are our past negative actions and our deluded states of mind. These two subsume into one, the delusions. Because of these negative states of mind, we act inappropriately by harming others, thus sowing the seeds of our future suffering. Given, as Buddha points out in the third Noble Truth, that we can be free of suffering – thank goodness! – we need to cut this cycle of madness. In relation to the two main causes, there are two main practices to be done. Tibetan Tattoo Of The Month! 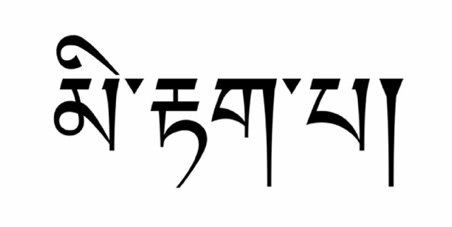 Tibetan Tattoo Translation Of The Month! This month's translation is 'Impermance'. Thanks for the request Karen from Denmark. Please send us a pic when you get your tat done! Valentine Discount For Our Fantastic Tibetan Life Newsletter Subscribers Only! Tibetan Tattoos Sacred Meanings And Designs E-book has grown from 56 to 108 pages! And the price is now only $27! But for you amazing subscribers, a 25% Valentine discount! Type 'Valentine' in the Discount Code box in the shopping cart. Valentine offer good only till midnight February 23rd. And remember...if your name is not in it, I will translate it for free! Usually tibetan translations cost about $20 for 1 to 3 words so this e-book chock full of translations and designs is a fantastic deal! Want can you do to help Tibet? Check out the following web sites and take action!